2016 marks the 10th annual World Rabies Day, declared by The Global Alliance for Rabies Control to raise awareness on rabies and rabies prevention worldwide. The Canadian Wildlife Health Cooperative (CWHC) is active both in the diagnosis and tracking of rabies in wildlife but also in collaborating with partners on control and prevention. Our quarterly reports include a summary of rabies cases diagnosed by province. Our Ontario region recently saw the re-occurrence of a raccoon strain of rabies previously eliminated from the province. The province of Ontario is leading a program to control rabies in wildlife by dropping bait that contain vaccine. Other provinces also have rabies surveillance and vaccination programs including New Brunswick and Québec. Educating people about the occurrence and risks of rabies is a critical step in preventing its spread. 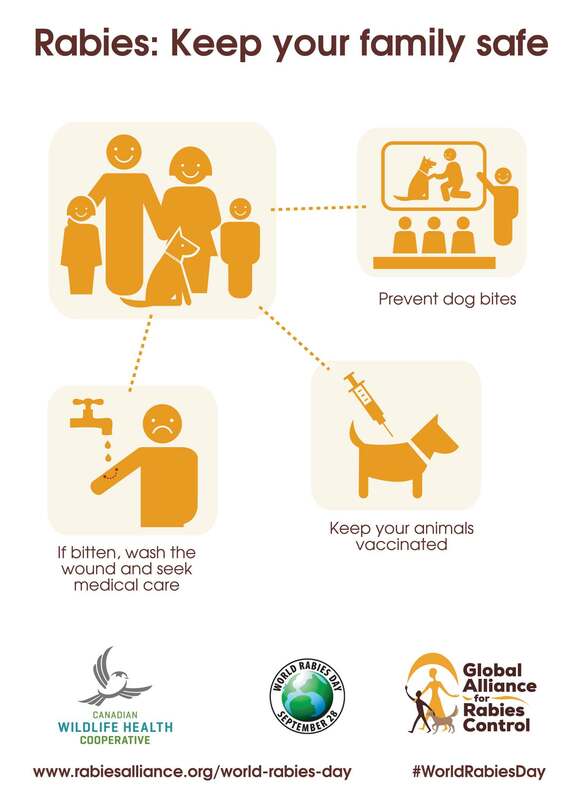 Here are two simple ways everyone can contribute to rabies prevention. Keep a safe distance. Don’t feed wildlife. Don’t touch a sick or dead animal. Call someone. If the animal appears sick, call a local wildlife rehabilitation facility for advice or your local wildlife officer. If the animal is dead, call your local wildlife officer or your closest regional CWHC centre for advice. The vast majority of human cases of rabies involve dogs. Un-vaccinated pets that are allowed to free-roam are much more likely to contract the virus. Dogs might have an encounter with a raccoon or skunk, and cats are particularly drawn to prey on low-flying bats. Rabies is a viral infection that is transmitted through saliva through bite wounds, scratches or other wounds. The rabies virus can be easily transmitted if your pet is allowed to run loose and interact with wildlife. First, keep your pet on a leash or under control while in wildlife areas. Second, vaccinate. Vaccination is simple, effective prevention. Keeping your pets rabies vaccinations up to date will keep your animals healthy, but also protect your family. 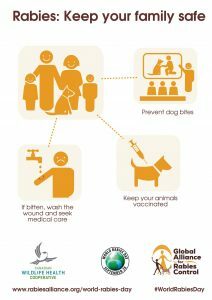 Modern vaccines are the only way to prevent the onset of rabies after exposure. Please treat any potential exposure to rabies seriously. Next story Building Northern capacity to monitor wildlife health aims to protect seal, caribou and narwhal resources.